Nokia Lumia. Say goodbye to that phrase, as this is the last Lumia device that we'll review carrying the Nokia name. With the move of Nokia Lumia devices to Microsoft Devices, the Nokia Lumia 735 the last in its line. Pitched as a selfie phone during its announcement at IFA 2014, the Lumia 735 slots into the middle of Microsoft Device's rather congested line-up. You have the Lumia 530, 535, 630, 635, and 830, before you get to the flagship 930 and larger 1320 and 1520 models, as well as the ageing 1020. To pitch it as a selfie camera is something of a misnomer: the launch of the Lumia Selfie app accompanied the Lumia 735, but it's not exclusive to this phone. The 735 has a 5-megapixel front-facing camera, but then so does the new Lumia 535, and we suspect future Microsoft Lumia devices will too. So the Lumia 735 finds itself as yet another Windows Phone mid-ranger. But is this a phone worth your time and money? If there's one thing you can't knock, it's Nokiasoft's design. Consistently using colour rather than the greys and silvers that dominate elsewhere, the 735 is immediately recognisable as part of the Lumia family. It measures 135.7 x 68.5 x 8.9mm and weighs 134g, so it's relatively lightweight, if a little larger than some other 4.7-inch devices. There's still a fair smattering of space top and bottom of the display, but it's a typical example of Lumia design. Importantly it has rounded edges so it's nice and comfortable to hold. It has a flattened top and bottom, which has the added benefit of meaning you can stand it up to take portraits if you want to. It's finished in the same quality polycarbonate shell that we're used to seeing on Lumia Windows Phones, and on this model you get Qi wireless charging built-in, which is really convenient and less common on devices at this price point. It might not deviate from Nokia's tried and tested approach, so could be seen as playing it safe, but we're happy with that. Nokia has been putting some good displays into its devices and here we have a 4.7-inch 1280 x 720 pixel resolution. That's pretty sharp, avoiding some of the graininess that you'll find on the Lumia 630. The 735 has a pixel density of 312ppi. It's an OLED display on this model topped with Gorilla Glass 3, as you'll find on the Lumia 930, setting it aside from the IPS LCDs that dominate the rest of the range. It offers great contrast and some lovely deep blacks. There's auto brightness too which we found to work well, along with display extras that come with Lumia devices, so you can change the colour tone or brightness profile too. Overall, it's a great display. The only real place it's a little letdown is at the bottom on the navigation bar - Microsoft's Windows logo with its diagonals doesn't render so well at lower resolutions, so looks a little jaggy, but that's not a huge problem. Sitting at the heart of the Lumia 735 is the quad-core Qualcomm Snapdragon 400 chipset, backed by 1GB of RAM. That puts the 735 in the mid-range, with similar specs to a number of rival Android devices like the Motorola Moto G.
There's 8GB of internal storage which is reasonable, but you do get support for microSD cards up to 128GB, so there's plenty of opportunities to add more of your content. The hardware loadout means that this isn't the fastest Windows Phone around. Throw it against the HTC One (M8) for Windows or the Lumia 930 and it doesn't compete too well. It's a little slow to open apps and when unlocking the phone you'll find yourself facing the "resuming" animation all too frequently. It offers a better experience than the Lumia 630, thanks to the increase in RAM, but is very much like the Lumia 830. Apps like the camera are a little slow to load, meaning you might miss that perfect moment. Microsoft has also expressed a growing interest in sports and fitness, recently announcing the Microsoft Band. The Lumia 735 has the SensorCore that will contribute things like step count, all handled through the Microsoft app. The SensorCore also enables tap to wake, so you'll be able to tap the display and have it spring to life, which is a feature we like, and not always available on mid-range handsets. There's a 2220mAh battery that is user changeable so you could potentially carry a spare. It's a reasonable performer and we've managed to get it though a day without too much of a problem. This is typical of Snapdragon 400 devices and the smaller scale display helps too. The built-in Qi wireless charging is also a benefit, as you can just plonk it on the charger at night with minimal hassle. Windows Phone 8.1 Update is integrated into the Lumia Denim release that the 735 launches with. It brings with it a range of features that continue to close the gap with the dominant platforms of iOS 8 and Android. Not all the Denim advantages are felt on the Lumia 735, but this handset still offers the full smartphone experience, covering all bases. There's increasing refinement too, with features like Wi-Fi Sense offering some smart sharing of Wi-Fi access with your contacts - if you want it to. We also like the fact that you can sync across Microsoft devices, so you can have a consistent colour scheme or wallpaper across your Windows desktop, Surface and Lumia device, for example. In the case of the Lumia 735, the bottom navigation bar hides itself, letting you swipe it back into place when needed. It takes a little getting used to, but it frees up screen space. There's always been a lot of talk about Windows Phone app availability - and that discussion still remains ongoing. Most major apps, services, and social networks are covered, but Windows Phone is rarely the first on the scene with a hot new app. For us we miss apps like Feedly or Hive by British Gas. Not critical for all, perhaps, but we're still not at the level where you have app parity across all the smartphone platforms. As Windows Phone has grown, so too have the native features it offers. Lumia devices offer more than others (more than the HTC One (M8) for Windows for example) and that has lead to some fragmentation within the settings. We like having options, but we think Microsoft needs to focus in keeping the settings clean - there's two different areas to control the display, for example. The Lumia 735 also comes with Cortana, Microsoft's personal assistant, that pretty much replaces search in a similar way to Google's search app. You can use voice to ask questions (or simply type them in as before), but Cortana will also serve up things like appointment results, set reminders or alarms, find music, weather and get directions. The results are good, but it's hardly groundbreaking by this point, especially to those who have been using Google Now or Apple's Siri alternatives. As we've mentioned this isn't the fastest Windows Phone on the market, but it works well enough. The experience is comparable to the Lumia 830, the biggest drawback being that it feels a little on the slow side. When Microsoft announced the Lumia 735, it came with the claim of having the highest resolution front-facing camera for a Windows Phone. That's not exactly the case now, with the HTC One for Windows and the Lumia 535 both matching it. Outside of the Windows Phone platform there are higher-resolution offerings such as the HTC Desire Eye, with its 13-megapixel front-facing camera. Exclusive to Lumia devices is the Lumia Selfie app; once installed it appears as a Lens in your camera, as well as a separate app. The app is less about capturing better selfies and more about post-processing those pictures, as it's full of fun filters and enhancements you can use to change your look. You can enlarge your eyes, slim your face, whiten your teeth and so on. It has a big problem however: it captures mirror images. So if you've only got one ear it will be on the wrong side of your head, your hair will be parted the wrong way and if you're a pirate then your eye patch will be on the wrong side too. Sadly, there isn't a mirror flip in the edit options to correct it. So don't use Lumia Selfie to capture selfies, use the front camera option of the regular Lumia Camera app instead, as this puts your picture the right way round. Lumia Selfie, however, can be used to edit any picture, so you can apply the improvements to any image you have, whether you've just taken it, or it's one from your existing collection of photos. The front camera is a good performer, offering good results in good light, but things always tend to look a little grainy. Many of the selfies we've taken have a slightly textured finish, which can - gasp - make your skin look more mottled than you might like. When the light drops things get grainier, so you'll lose the detail as the ISO sensitivity gets pushed up, but it's not a disaster. Outdoors on the bright day, however, is when you'll get some pretty good shots. Is the Lumia 735 a killer selfie camera? Not really. It's pretty typical of the results you'll find elsewhere. There seems to be some degree of randomness to Lumia cameras: most at the affordable end have a 5MP camera, then there's the 10-megapixel PureView of the 830, and the 735 arrives with a 6.7-megapixel camera. It has a Zeiss lens and LED flash and while it isn't the best performer in the Lumia range, it's still pretty strong. There's plenty of detail captured, although some grain from image noise can be spotted even as low as ISO 200. You'll only really notice that if viewing at full size - in normal social applications, it won't be a problem. Lumia Camera is a little slow to respond, however, and moving around the interface to access settings (like the front camera) takes just a little more time and effort than is perhaps expected. You also get Full HD video capture and the normal Windows Phone arrangement of being able to add extra Lenses to let your camera do other things, like capture panoramas, for example. Overall the Lumia 735 will give you results that in may cases out perform similarly priced rivals, so we're happy with the experience. 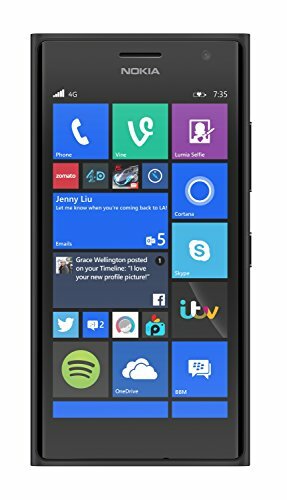 However, the Lumia 735 is available for just over £200 SIM-free, meaning it's something of a bargain, and if anything raises the question over the value of the Lumia 830. At that price, the performance is fitting - although we daresay that similar spec Android devices are faster for day-to-day operation.